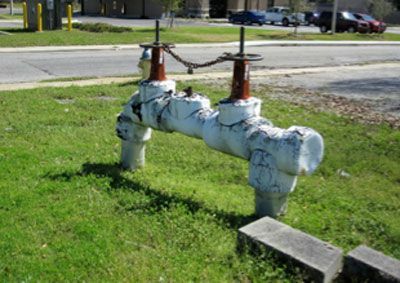 In the interest of public safety and security of the water supply, the Alabama Department of Environmental Management now requires MAWSS to install a backflow prevention device or dual check valve, on the customer’s side of the meter whenever the water service line and meter are replaced. This may require some changes to your plumbing system. When a dual check valve is installed on your water service line, water is unable to flow back into the public water supply. This creates a closed system in your water plumbing and can result in a spike in pressure, also known as thermal expansion. 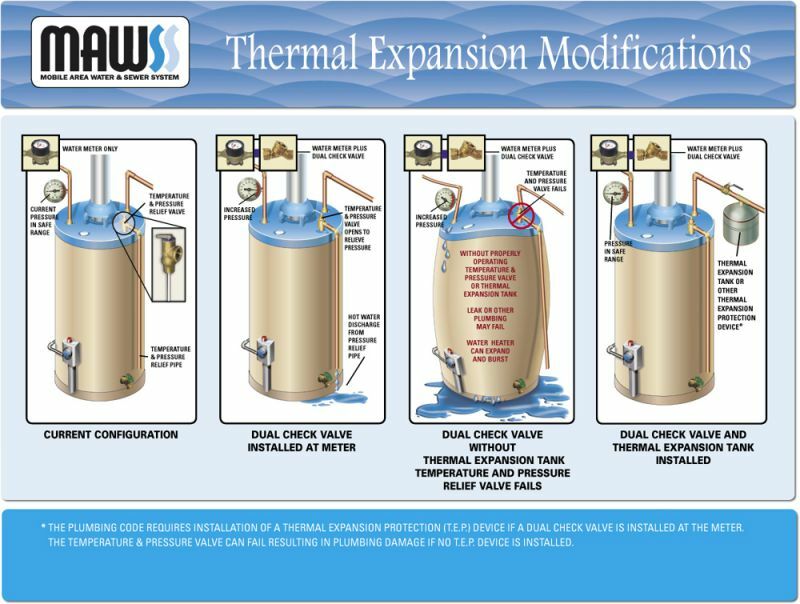 When water is heated in a tank-type water heater, it expands. Before the dual check valve was installed, this water flowed back towards the public water supply. With a dual check valve in place, water stays on the customer’s side of the meter which can increase pressure. If the pressure is more than your plumbing system can handle, it could set off the temperature and pressure valve (T&P Valve) on your hot water heater, causing it to leak. There is also the possibility of it causing damage to the water heater, pipes or other fixtures (See illustration). A Temperature and Pressure Valve alone is not adequate to address thermal expansion on a continuing basis. Mobile’s Plumbing Code requires that additional devices be installed, such as a one gallon thermal expansion tank or a pressure relief valve that discharges to the outside of the building. Contact a licensed plumber or the City Plumbing Inspection Department to get details on how best to protect your plumbing. It is also important to test your Temperature and Pressure Valve to be sure it is working properly and that the valve discharge is to an area that will not cause property damage or personal injury. Please refer to the water heater manual or a licensed plumber to determine how to test the Temperature and Pressure Valve.